On October 23, the newly-formed Middle School hockey team played its first-ever competition, defeating Roxbury 9-1. Leading the scoring for Gill were Ryan Getzoff '23 with three goals and an assist, Lucas Robins '22 with two goals and an assist and Caleb Politsky '22 with one goal and an assist. Additional goals came from Liam Jones '21, Nico Gattoni '23and Matt Raymonds '21, and Jake Schmidt '21 recorded an assist. On goal, Matt Cooper '21 contributed 13 saves. Reflecting on the game, head coach Pete Roslund said, "The outstanding effort from the kids in this first Middle School hockey game was a fantastic way to start this season." According to Roslund, who also teaches physical education (PE) at Gill, this year provided a great opportunity to put together a Middle School team because of the number of students interested in the sport. The eighteen-man roster is comprised entirely of students who play outside of school. On weekends from October through March, the group will come together to represent Gill on the ice. 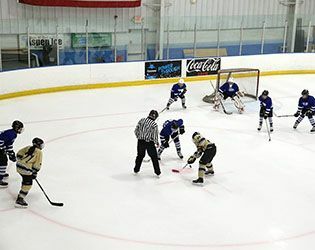 In addition to offering Middle Schoolers a chance to skate together as a GSB team, the program gives the students valuable experience for Upper School hockey. It also bodes well for the future of Gill’s Upper School hockey program. The sport has been garnering increased interest at the school over the past several years, and Roslund looks forward to seeing these Middle Schoolers playing for the varsity squad when they get to Upper School. So does Athletic Director Tim Davis, who said, "This solid foundation of a Middle School ice program fosters a strong future for the sport at Gill."